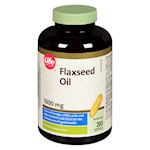 If you are looking for a supplement with well balanced Omega fatty acids, you have found it. 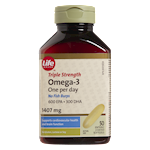 Formulated with high quality polyunsaturated oils derived from organic flax, borage and deep-water fish, Life Brand Omega 3-6-9 1200 mg softgels contain a balanced blend of omega fatty acids. 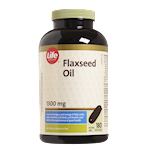 Flaxseed oil provides a vegetable source of alpha-linolenic acid (ALA). Borage seed oil contains an omega-6 fatty acid called gamma-linolenic acid (GLA) and fish oil provides the omega-3's EPA and DHA. 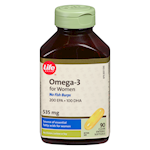 A source of essential omega-3 fatty acids for the maintenance of good health. 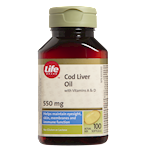 Helps support cardiovascular health and brain function. Source of EPA and DHA for the maintenance of good health. Softgel Capsule (Gelatin*, Glycerin, Purified Water, Caramel), Natural Tocopherols. This product contains 12.5 calories and 1.2 mg of sodium per softgel. No gluten, lactose, yeast, preservatives, artificial flavours or colours. (Adults): Take 2 softgels 3 times daily or as directed by a health care practitioner. Keep out of reach of children. 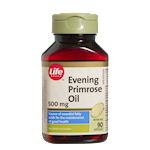 Consult a health care practitioner prior to use if you are taking blood thinners.